This is the best cream eyeliner that I have ever used. It is called “Ink for eyes” from Urban Decay in the color Zero. Once I tried it I was hooked and it is what i use daily. 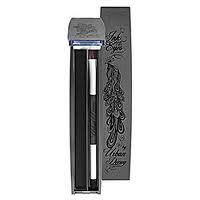 It is easy to use and the pigmentation on this product gives you a great deep black. Another great factor is that it last a long time. It is well worth the price. Another great item to note is that this is a vegan product, this means it does not contain any animal-derived ingredients. This product was also created without being tested on animals, for all you animal lovers out there. It costs $22 and can be found at urbandecay.com Try it out and enjoy! !